The modern coyote shotgun comes in many shapes and flavors, but they all have a few things in common. The ability to handle modern 3.5" 12 ga. magnum ammunition is a must for animals the size of a coyote. Run and gun hunters need a slim and trim gun that slips easily and quietly from a storage case or vehicle. They all have recoil - but there are a few tricks than can help the hunter tolerate those big loads of buckshot. Shotgunning is not for everyone. The recoil is a substantial hit. The calculated energy from a pump or O/U shotgun firing Winchester's #4 buck load is a comparable to a scoped .458 WinMag rifle. Coyote hunting in thick cover has a lot more in common with waterfowl hunting than it does with hunting for turkeys. Coyotes present a variety of fast-moving, coming, going, and crossing shots. Moderately tight patterns (full choke) are preferred over super tight turkey chokes. 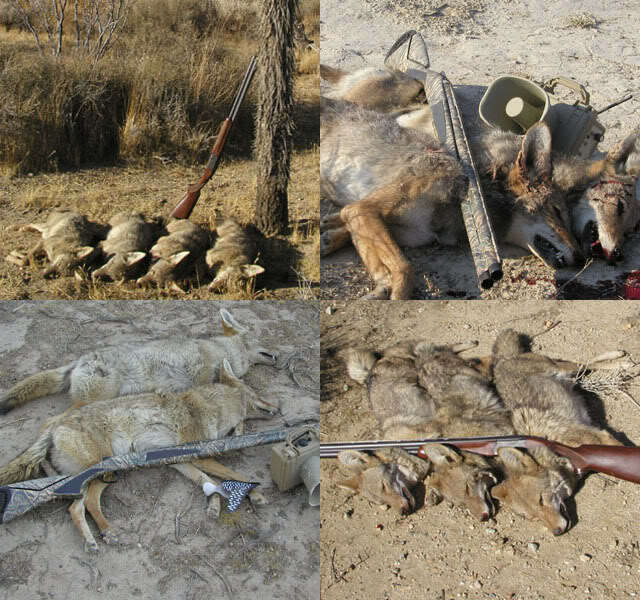 Both modern 3.5" autoloading and double-barreled shotguns are particularly well suited for hunting coyotes. Standard magazines will hold three. Whether you carry more in your pockets or more in the gun is a preference. From experience, reloading an O/U or an auto in the thick of a good stand and killing multiples is not an issue if you're prepared. The shotguns shown here are the Browning Cynergy 3.5 and Beretta Onyx 3.5. Update needed. Since this was written, CA banned lead shot for coyote hunting. Wolfram alloys are dense enough to kill well, but arguably tough on barrels, chokes, and wallets at $6 per round. Hevi-Metal 3.5-inch are $25 per box of 25 and work well at medium shot gun ranges.